By now you’ve likely heard all about the journey that Caitlyn Jenner has gone through to date. At the time, it made news headlines around the world, showing clips of the paparazzi trying to get their first shot of the former Olympian. I can’t be bothered to lend much interest in celebrities but, being a car guy, the one thing I did notice when those clips ran on the news was that Jenner more often than not seemed to be shown in a Cadillac Escalade. Her ex-wife and step daughters seemed to favour the Mercedes-Benz G-Class. This got me thinking a bit about how much cars can really be a reflection of our personality. Having never driven any generation of the Escalade, I was excited to learn I would finally get some seat time and figure out what it is about this vehicle that celebrities, rappers and sports stars seem to love and how it reflects the personalities of such people. 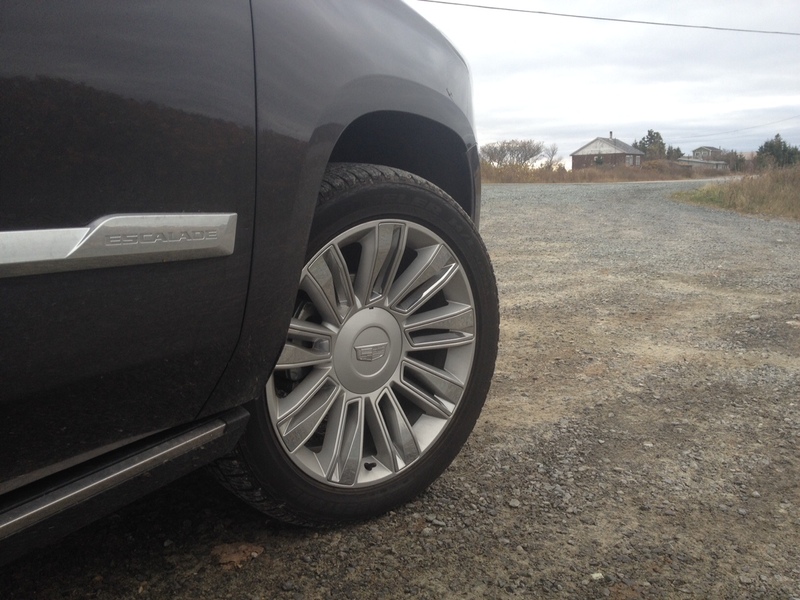 First things first, the Escalade gets noticed. Big time. 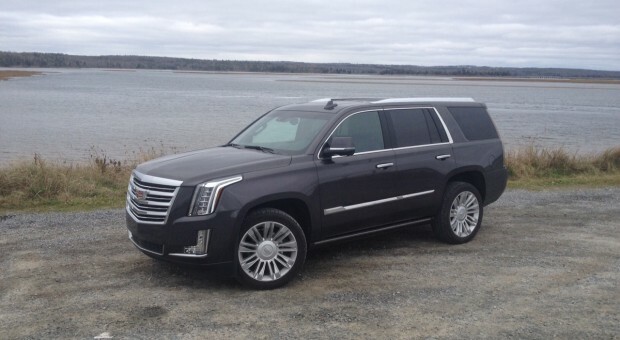 While GM makes cheaper, but admittedly still good looking versions of the Escalade in the form of the Tahoe and the Yukon, they don’t get nearly the same kind of attention. New for this generation is a bigger, more pronounced front grille along with corporate looking vertical LED headlights, with LED daytime running lights. Odd that the flagship of the brand doesn’t get LED turn signals up front when even the Yukon does. Moving along the side profile the first thing you’ll notice are the beautiful 22-inch wheels that come standard on the top of the line Platinum model and out back there are the biggest set of tail lights you’ve likely ever seen on a production model. A friend of mine called them “pretentious” and that they reek of attention snobs, but I actually like their design. Regardless of how you feel about the Escalade’s looks, two things can be said for certain: the Escalade has evolved nicely into the best looking version yet and that the Escalade draws about as much attention as if Caitlyn Jenner herself was sitting behind the wheel. I did notice that it seemed to grab the attention of males rather than females. As you open the driver’s side door, an otherwise hidden running board automatically deploys in order to make ingress and egress a lot more dignified. Once you close the door, the running board will automatically go back into its hiding spot. 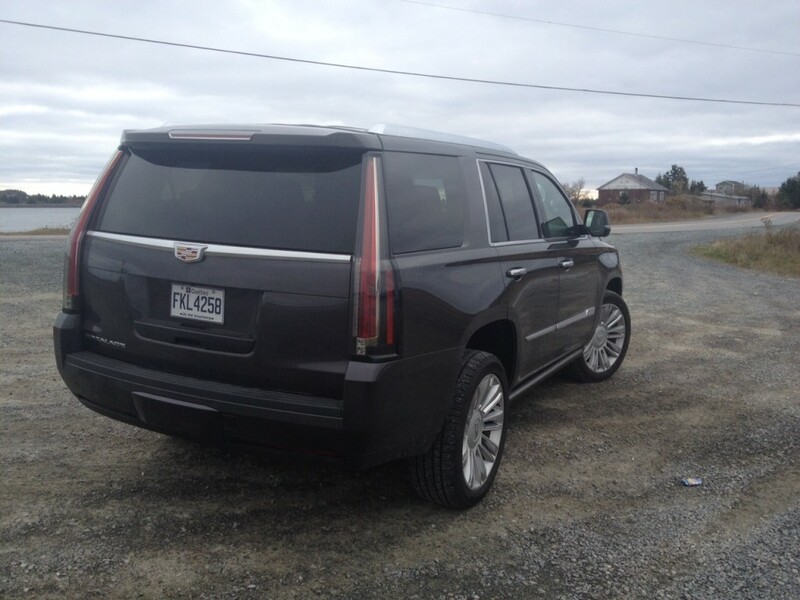 Once you get your keister inside, you’ll be treated to typical modern Cadillac design. The wood features throughout is real American walnut wood. The centre stack is largely glossy piano black and when you start the engine, LEDs will light up the centre stack. Also in typical Cadillac fashion, there are very few tangible buttons. Everything from the heated seats to the temperature to the volume is touch controlled. While I found they responded better than some touch systems, tangible buttons would still be more welcomed. There is a secret cubby hole housed behind the centre stack, again motivated by touch command. 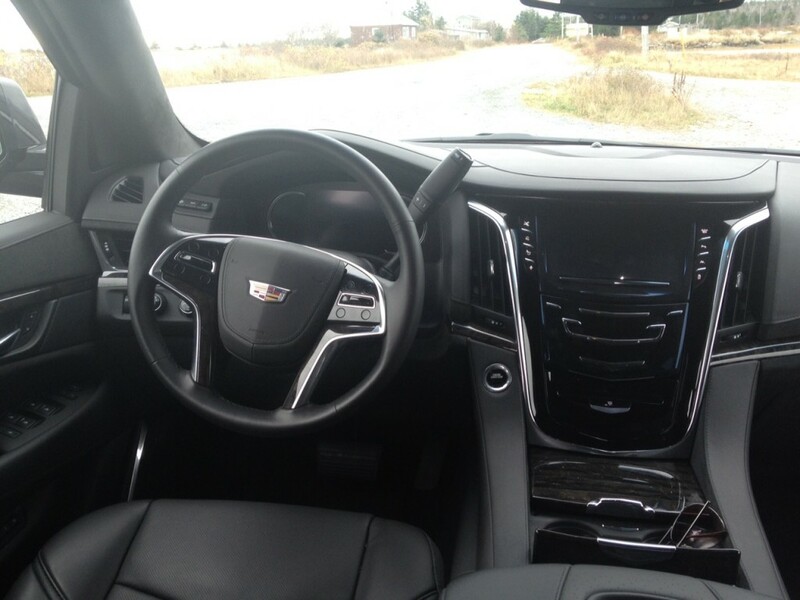 Cadillac incorporates their CUE infotainment system where you a lot of the controls are housed and it is generally as hated as much as Ford’s MyFord touch system. I can see why. Not only does it rarely respond to commands, it is glitchy, dim witted and not very logically laid out. It’s also quite the reach considering how wide the cabin is, but that wide cabin enables lots of large storage in between the two front seats including a cooler for your drinks. On top of the cooler there is a remote keyless charging pad for newer model cell phones. Since I’m still chugging away with the iPhone4S, I was not able to test it out. The rather good looking and feeling steering wheel is housed in front of the all LCD screen where you’ll find your speedometer and tachometer among other things. It’s all programable to choose the look you prefer with different emphasis on things such as your digital speed, what satellite radio station you’re currently listening to and how much gas you’re sipping chugging. I’ll get to the later in a moment. But the readouts are clear and the customization is a cool feature, as is the heads up display which projects things like your speed (and what the speed limit is on almost any road) onto the windshield so that you don’t actually have to take your eyes off the road. The seats are cushy and comfortable and they also have a massage feature, which can be controlled on the side of the seat. I’m not sure why GM decided to locate them next to the power adjustable seat switches, especially since it means you can’t really see it only feel it. It takes some getting used to but once you do, you’ll find a roll massage feature, a knead feature and an anti-fatigue feature for the driver. Overall they are decent, but I think they are bested by Audi’s massaging seats. In the second row you’ll find equally comfortable captain’s chairs along with separate climate controls and heated seats. 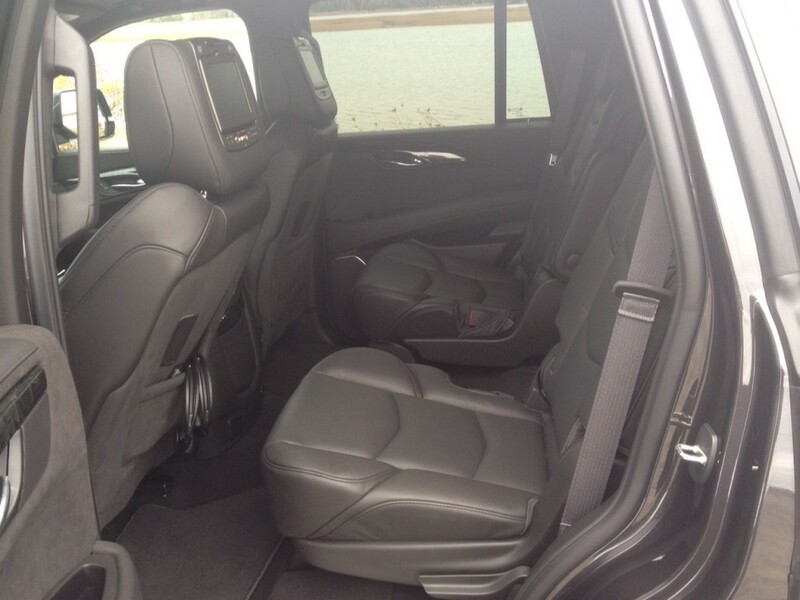 There’s no cooled seats or massagers so you can consider this ‘second class’ aboard the Escalade. That means ‘third class’ or ‘coach is in the third row and it really does take on a similar feel with difficult access if you choose to pass through the middle. Once you get there you’ll find that having legs is a fairly large disadvantage. Not only is the bottom part of the seat pretty much perpendicular with the floor resulting in your knees pretty much touching your chin, but they will be crammed against the second class seating. 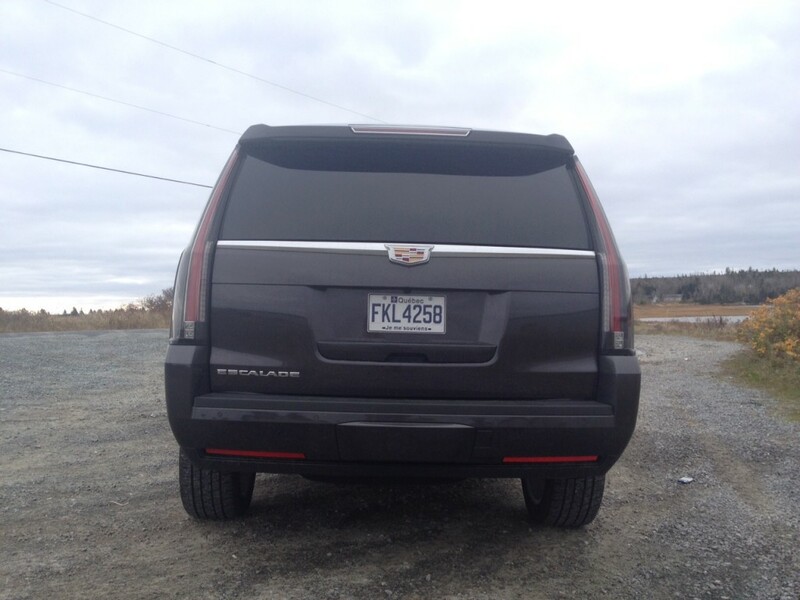 I can only imagine that Guantanamo Bay uses the third row seats of Escalade for prisoners. The third row truly is only meant for children, which is disappointing considering how big the Escalade is in the first place. 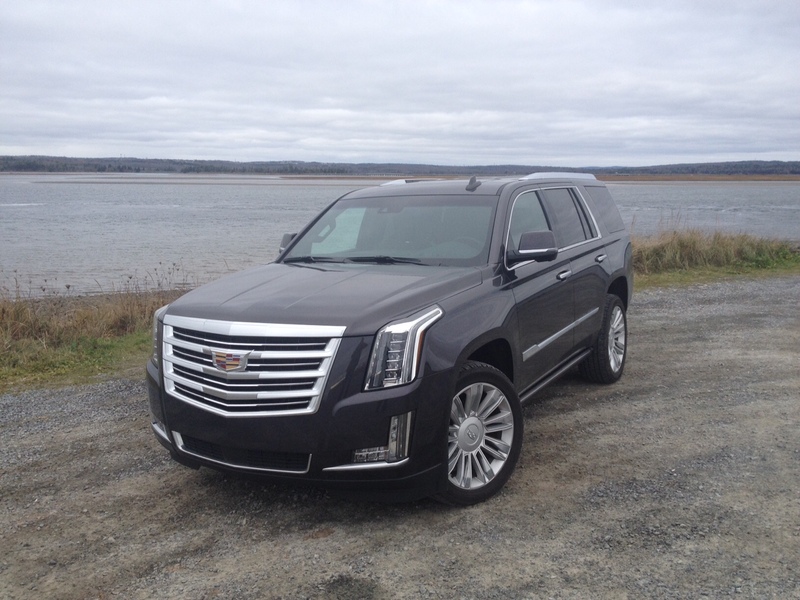 Powering the Escalade is a massive 6.2 litre V8 producing 420 horsepower and 460 pound feet of torque mates to a now standard 8-speed automatic. The end result is a growl that likely would scare a lot of children at start up. All that power makes for a great soundtrack when pushed, but you won’t feel as if you’re going particularly fast. This is the same V8 that can be had in the GMC Sierra and I found it hustled the truck a lot quicker than this porker. However the 8-speed is quite good at mitigating shifts which can be controlled manually, but there is no real reason to do that. 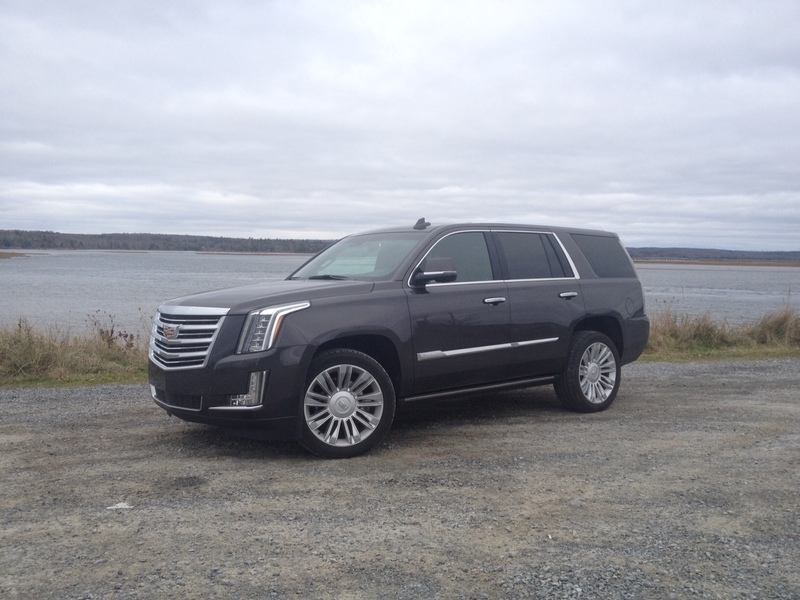 On the road, the Cadillac feels big but not as big as you’d expect, especially if you’ve driven previous generations. This new version features electric power steering which actually provides a fair amount of decent feedback to the driver. Body roll is a lot more controlled than you’d expect thanks to magnetic ride control which makes the Escalade relatively toss able in the bends, but emphasis on the word relative. The cabin is as quiet as you’d expect and the suspension soaks up most of the imperfections in the road. Considering this is one of the few body-on frame SUV’s still available for purchase, the ride quality is super smooth. There’s also cylinder de-activation which brings the Escalade down to a V4 when lots of power isn’t needed in order to help out with fuel consumption. 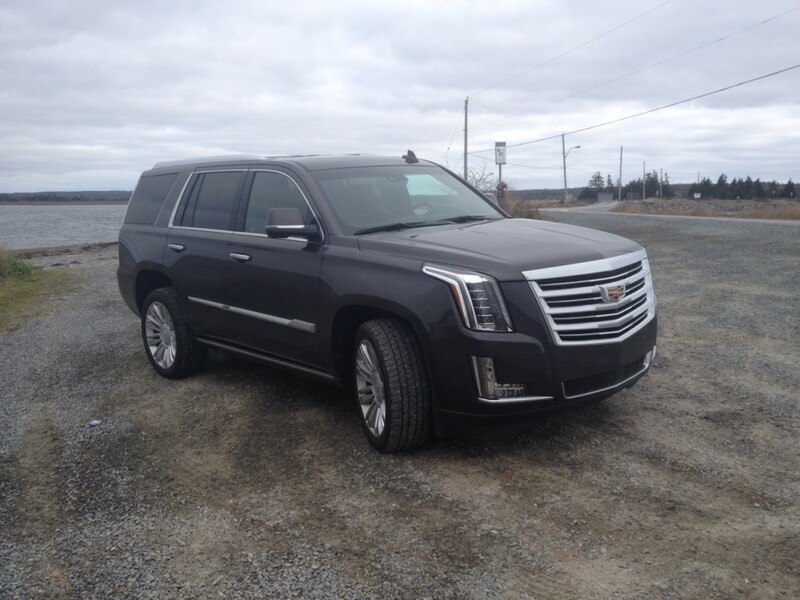 And to be honest, the Escalade needs all the help it can get in this department because the official ratings are 16.0 L/100 kms in the city and 11.2 L/100 kms on the highway. I drove my tester primarily around town and returned 18.4 L/100 kms. For comparison’s sake, the GMC Sierra I tested earlier in the year equipped with the same 6.2 litre engine returned 17.9 L/100 kms and I thought that was pretty horrible. I suppose it stands to reason that if you can afford the Escalade’s price, you can likely afford all that gas. 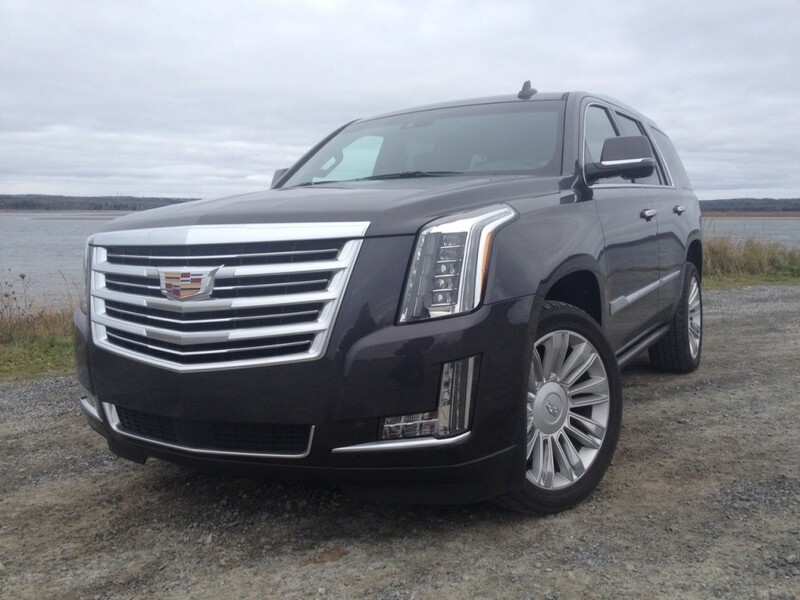 But that, in a way, is kind of my problem with the Escalade: its price. 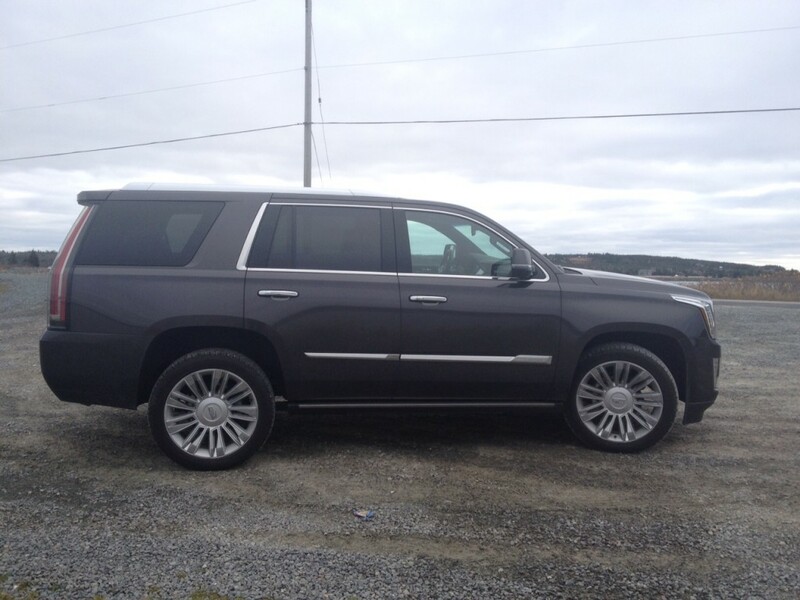 Sure it has most of the luxury and latest tech you’d expect but the problem is, so does the Yukon. 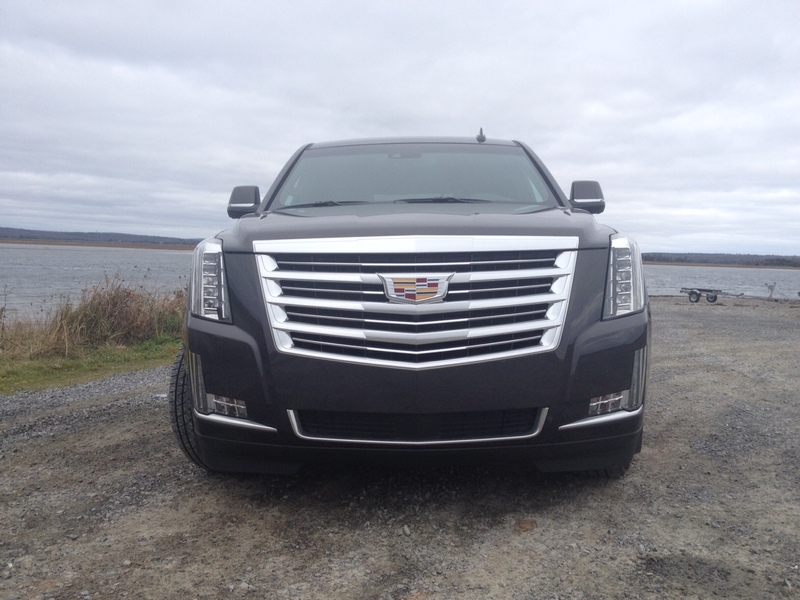 The Yukon looks just as nice to my eye, has close to the same amount of luxury, can be had with the same engine and it even has LED front turn signals which the Escalade does not. Basically, if you go with the Yukon, you can save yourself $20K and you won’t be losing much in terms of content or performance really. But maybe that’s why celebrities like the Escalade. It shows that they could care less about a 20,000 dollar difference because they are just that rich. And let’s be honest, the Jenner and Kardashian brand is largely based on being seen and the Escalade gets noticed far more than the Yukon does. But for normal folk like you and me, the Yukon should do the trick just as well as the Escalade. Why is this worth 20 grand over a Yukon again?